Is the LG 65LA970 part of a new generation of smaller, cheaper 4K screens? The 65-inch LG 65LA970 Ultra HD (UHD) TV unveiled at CES will be joined by a lookalike 55-inch model, the LG 55LA9700, when it's launched worldwide towards the end of the year. The pair will partner the already available 84-inch LG 84LM960V. Principal competition will come from the 84-inch Sony KD-84X9005 4K TV, while Sony also plans to launch its own 55- and 65-inch 4K variants later in the year. Pricing has yet to be confirmed. The new screen, along with its smaller stablemate, mimics the design of its 84-inch parent, with integrated speakers and sweeping, mirrored pedestal. Dimensions are not confirmed although the slim bezel and thin chassis should make it comparable with the brand's 65LM620TV Full HD offering, at 1539 x 924 x 38.1mm. Panel resolution for both screens is a pixel-packed 3180 x 2160. As expected, this TV offers Passive 3D plus access to LG's Smart portal, home to all the usual streaming services and apps. What is new for 2013 is an improved user interface. An advanced SmartShare feature promises quick content access from mobile devices through the use of a place anywhere NFC tag, while a cool On Now content aggregator makes it easier to find stuff to watch. Also included in the package is the brand's new Magic Remote with integrated microphone, for less shouty voice control, and an on-screen 'air mouse' cursor. When you factor in the relationship between perceived resolution and viewing distance, there are diminishing returns when it comes to 4K resolution in smaller screen sizes. The joy of the brand's 84-inch model is that you can sit within a couple of metres and not be aware of any pixel structure. There are similar clarity benefits with this 65-incher, but it becomes debatable whether the extra resolution of the 55-inch model will justify the price premium. There's no doubt that fine detail performance is outstanding though; native 4K content demonstrated on the CES showfloor appeared sensational. Passive 3D is also a wow, with Full HD Blu-ray delivered at Full HD resolution. We were really impressed with the sound system on LG's 84-inch mega-set, and the good news is that both these incoming 4K models boast the same 2.2 audio configuration, with downward firing stereo tweeters and rear mounted woofer. This translates to bold, punchy audio. 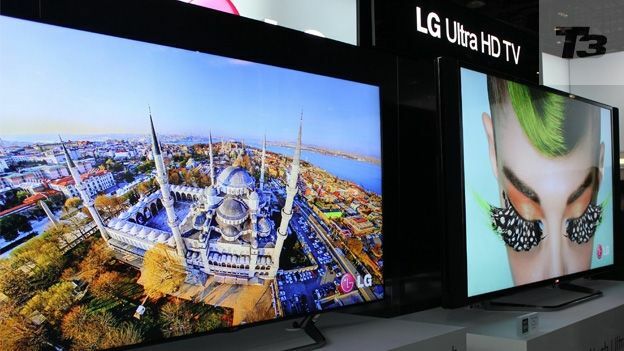 LG's second-gen Ultra HD TV heroes are hugely impressive. At CES, both models dazzled with their image clarity and smart, minimalist design. They may have been early samples, but we suspect they won't differ too much when they go into final production. Add in the brand's excellent media management and NFC sharing functionality, and you have a cutting-edge viewing experience. It remains to be seen though if the brand can sort out the picture processing lag noted on the 84-inch model. Unless that's sorted these TVs could prove unsuitable for gamers.